Why do movies seem more impressive in a movie theater? Yes, the screen is much much bigger than your home HDTV. But what makes the movie experience so exhilarating is the sound. In a movie theater, you are surrounded by speakers. There are speakers behind the screen, mostly conveying the dialog. There are speakers in the walls to the left and right of you, largely for music and to communicate movement across the screen. There are speakers alongside and behind you that create a sense of immersion and for special effects like helicopter fly overs. And there are subwoofers that produce deep bass that rumbles your seat that puts you in the middle of the action. And even though the movie visuals are only in front of you – not on screens to your left and right – you feel as if you're enveloped by the film. With some easy-to-follow tips, you can create a movie theater-like surround sound experience in your living room, den or even your bedroom. Just like in a movie theater, home theater "surround sound," a concept pioneered by Dolby Laboratories, uses multiple speakers placed around your room to re-create a three-dimensional sound environment. The good news is you don’t need as many speakers as a conventional cinema to get a great surround sound experience. You'll see surround speaker systems referred to as 5.1, 7.1, 9.1 – even 11.1. The first number refers to the number of speakers, the second to a separate bass channel – most surround sound speaker systems include a separate "subwoofer," which generates the boom in explosions and other rumbling special effects. 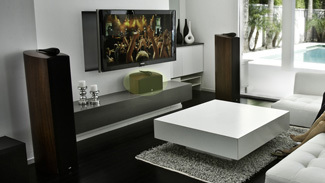 two "rear" speakers, placed to either side of your sofa or behind you, depending on the room size and configuration. A separate subwoofer, which gives you the rumbling bass essential for feeling the action in today's blockbuster movies can be placed almost anywhere. Rather than mixing and matching speakers from different companies to create a surround sound system, it's best to buy a complete 5.1 speaker system. In a system, all the speakers are sonically matched and each is designed to perform its specific placement job. Center, left, right and rear are a good guide to where your surround speakers should be placed, but there are subtleties. 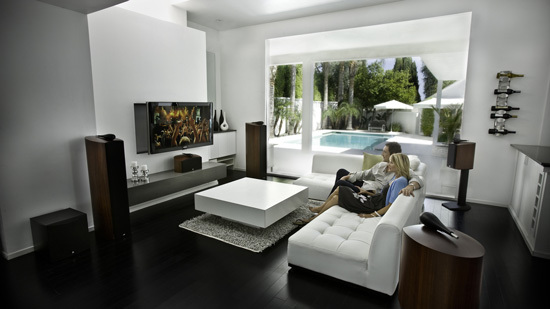 Center: The center channel speaker delivers mostly dialog, which is more than 60% of what you hear in a movie. The best placement of a center channel speaker is just above or immediately under the TV. The goal here is to “localize” dialog to the screen. 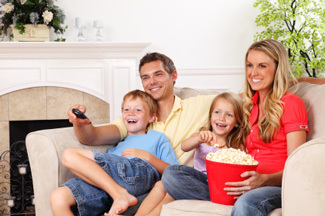 If your TV is at eye level, try to aim the speaker so the voices are directed precisely at where you're seated. This will help create the illusion of the voice emanating from the screen. Front Left/Right: The left and right speakers should be placed so the top part of the speaker is at ear-level. Ideally, the left/right speakers should be situated on either side of your TV, the same distance from you as your screen and the center channel speaker. They should be equidistant from each other and from you to create an equilateral triangle. Rear: Ideally, rear speakers should be placed to the side behind you, at generally the same distance from you as the front speakers. If your room size prevents optimum rear speaker placement, place them to the left or right of your main seating area. To keep them at the same distance from you as the front speakers, mount them above doors or even higher near the ceiling. Subwoofer: Unlike the main speakers, which have to be pointed at you, subwoofers emit low frequency bass signals that are omni-directional – you'll hear and feel the bass regardless of where you place it. But a subwoofer does need a clear air path, so make sure none of its openings – the front speaker or the open "port" most have on the side, rear or bottom – are blocked. As room dimensions can impact the performance of a subwoofer, be sure to experiment with subwoofer placement to achieve the best sonic performance for your listening location. Floor-standing speakers will have bass drivers built-in, reducing the need for a separate subwoofer. If your room presents some speaker-placement compromises, you can compensate and make sure your surround system sounds evenly balanced using the speaker settings in your AV receiver. Speaker size is not necessarily an indication of how good a speaker is. Several companies make excellent-sounding compact cube speakers, designed to be used with a subwoofer, that produce just as much sound as tabletop or floor-standing speakers without monopolizing a room's décor. With a small room – a den or your bedroom – your sofa or bed is likely set against the far wall opposite the TV, which means the speakers closest to your ears will be the rear surround sound speakers. If possible, try to mount the rear speakers high in the corners above your seating/lying position, and use the AV receiver speaker settings to compensate for the volume if they're still too close. While a small room presents speaker challenges, a large room presents opportunities to create a more expansive 7.1- or 9.1-channel system. A 7.1 surround system adds rear surround speakers. So you’d have a pair of speakers at 90 degrees and another pair at 135 degrees from the center. Another 7.1 option is to add a pair of height speakers, speakers three to five feet higher than the floor standing speakers, above the left and right front channel speakers. A 9.1 system uses a 7.1 surround configuration on the floor and adds left and right height speakers above the left and right front channel speakers. Dolby Height identifies non-directional elements in the surround mix, such as wind whispering through trees, or the sound rain makes when it hits the ground around you, creating an even more immersive listening experience with more depth and perception. The biggest challenge a surround system presents is often wiring your rear speakers, which can be as far as 30 feet away from the AV receiver. You can lay your rear speaker wire under carpeting or rugs, but this isn't the safest solution and you may get an unsightly bulge. A more elegant solution is stringing the rear speaker wire through thin, white cable conduits available at most hardware stores – long, white plastic tubes open on one side with adhesive backing. You place the speaker wire inside the tube, and then stick the tube along the baseboard. You can even buy left- and right-corner pieces to bring the wire up and around door frames. You can paint the conduits the color of your baseboard or wall, leaving no one the wiser. I have a smaller room that I am setting up my home theater in. So, I think I will run into the problem of the rear speakers being too loud. When adjusting the sound for these speakers, should I do it by ear, or is there a recommended setting such as setting the volume 40% lower than the other speakers? I never knew how to properly place the speakers. My wife and I just bought a surround sound system and were wondering where to put everything. Thank you for the article about home theaters, it’s a huge help! The room I’m putting my system in doesn’t have space for an 8 foot space behind the sofa, it’s against the back wall. In fact, the whole house isn’t much bigger than the room shown. The advice above isn’t rubbish just because your have a small room. For optimum sound quality, you would want to rear speakers at an equal distance to the front speakers. If that’s not possible, place them to the left or right of your seating area. It won’t be optimal, but will still work. And you may be able to make some adjustments for this difference in distance depending on what surround sound system you are using. Great tips, I like how you broke it down into big and small room options when choosing a speaker. My brother in law has been helping me install a home theater setup complete with projector in our basement and it’s been really fun to see your ideas. We ran into a situation though where we’re going to have to run new cable through a wall, so we’re going to have to hire a professional.